Christine recorded her next CD over two nights at the Dakota. We were there for the second night, and so were many of Christine's friends and family members, and a table full of people celebrating the birthday of someone named Ginger. Did Ginger et al. realize a live CD was being recorded? Did they care? Might someone have announced this from the stage at the start and respectfully requested the whole audience hold it down a bit under the circumstances? Might a manager have gone to the table to politely suggest they modulate their voices or at least not shriek with laughter and hiccup loudly? Christine sang beautifully, and her band was right there with her. I liked their Latin arrangement of "If I Were a Bell," and their speedy (maybe a little too speedy?) "Surrey with the Fringe on Top," and the lovely "Estate" (where Christine's voice became lower, more resonant and emotional), and the Harold Arlen tunes; someday I hope she will do an all-Arlen CD, because it's clear she loves his music and it's a good fit for her voice. Dave Karr's flute on the "Tea for Two" cha-cha was charming. I enjoyed "Alone Together" arranged for bass, drums, and voice, "One More for the Road" for piano and voice, and their fresh take on "Summertime," one of the world's most recorded songs. Christine looked happy and relaxed. I look forward to the CD. Read a brief interview with Christine on MinnPost. 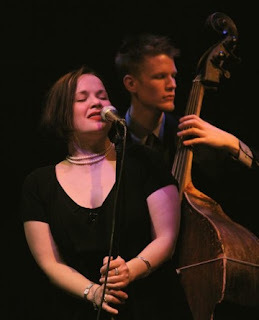 Photo of Christine Rosholt and Graydon Peterson by John Whiting.